Not to be confused with cannabidiol or cannabinodiol. Cannabinol (CBN) is a non-psychoactive cannabinoid found only in trace amounts in Cannabis, and is mostly found in aged Cannabis. Pharmacologically relevant quantities are formed as a metabolite of tetrahydrocannabinol (THC). CBN acts as a partial agonist at the CB1 receptors, but has a higher affinity to CB2 receptors; however, it has lower affinities relative to THC. Degraded or oxidized cannabis products, such as low-quality baled cannabis and traditionally produced hashish, are high in CBN. Unlike other cannabinoids, CBN does not stem directly from cannabigerol (CBG) or cannabigerolic acid (CBGA), but rather is the degraded product of tetrahydrocannabinolic acid (THCA). If cannabis is exposed to air or ultraviolet light (for example, in sunlight) for a prolonged period of time, THCA will convert to cannabinolic acid (CBNA). CBN is then formed by decarboxylation of CBNA. In contrast to THC, CBN has no double bond isomers nor stereoisomers. Both THC and CBN activate the CB1 and CB2 receptors. Chemically, CBN is closely related to cannabidiol (CBD). CBN is not listed in the schedules set out by the United Nations‘ Single Convention on Narcotic Drugs from 1961 nor their Convention on Psychotropic Substances from 1971, so the signatory countries to these international drug control treaties are not required by these treaties to control CBN. In Canada, CBN is a Schedule II controlled substance as defined by the Controlled Drugs and Substances Act. In the United States, federal and state laws regarding the legality of cannabis products are confusing and at times contradictory. CBN is not listed in the list of scheduled controlled substances in the USA. However, it is possible that CBN could legally be considered an analog of THC or CBD, both of which are Schedule I substances, and therefore sales or possession could potentially be prosecuted under the Federal Analogue Act. It is also possible that CBN may not meet the legal standard of an analogue (of THC) for the purposes of bringing forth a prosecution under the Federal Analogue Act. In December 2016, the Drug Enforcement Administration added marijuana extracts, which are defined as any “extract containing one or more cannabinoids that has been derived from any plant of the genus Cannabis, other than the separated resin”, to Schedule I. This action has led to additional uncertainty about the legal status. ^ David R. Lide (2012). CRC Handbook of Chemistry and Physics. CRC Press. pp. 3–90. ISBN 978-1-43988049-4. ^ Sigma-Aldrich Co., Cannabinol solution, 1.0 mg/mL in methanol, analytical standard, for drug analysis. 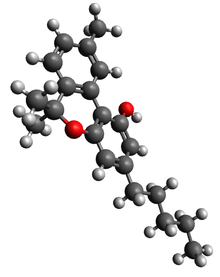 ^ Cannabinol in the ChemIDplus database. ^ Karniol IG, Shirakawa I, Takahashi RN, Knobel E, Musty RE (1975). “Effects of delta9-tetrahydrocannabinol and cannabinol in man”. Pharmacology. 13 (6): 502–12. doi:10.1159/000136944. PMID 1221432. ^ Andre, Christelle M.; Hausman, Jean-Francois; Guerriero, Gea (2016-02-04). “Cannabis sativa: The Plant of the Thousand and One Molecules”. Frontiers in Plant Science. 7: 19. doi:10.3389/fpls.2016.00019. ISSN 1664-462X. PMC 4740396. PMID 26870049. ^ McCallum ND, Yagen B, Levy S, Mechoulam R (May 1975). “Cannabinol: a rapidly formed metabolite of delta-1- and delta-6-tetrahydrocannabinol”. Experientia. 31 (5): 520–1. doi:10.1007/bf01932433. PMID 1140243. ^ Mahadevan A, Siegel C, Martin BR, Abood ME, Beletskaya I, Razdan RK (October 2000). “Novel cannabinol probes for CB1 and CB2 cannabinoid receptors”. Journal of Medicinal Chemistry. 43 (20): 3778–85. doi:10.1021/jm0001572. PMID 11020293. ^ Petitet F, Jeantaud B, Reibaud M, Imperato A, Dubroeucq MC (1998). “Complex pharmacology of natural cannabinoids: evidence for partial agonist activity of delta9-tetrahydrocannabinol and antagonist activity of cannabidiol on rat brain cannabinoid receptors”. Life Sciences. 63 (1): PL1–6. doi:10.1016/S0024-3205(98)00238-0. PMID 9667767. ^ “NIA National Cancer Institute; NCIthesaurus”. Cannabinol (Code C84510). ^ “Controlled Drugs and Substances Act (S.C. 1996, c. 19), SCHEDULE II”. Government of Canada. ^ Mead, Alice (2017). “The legal status of cannabis (marijuana) and cannabidiol (CBD) under U.S. Law”. Epilepsy & Behavior. 70 (Pt B): 288–291. doi:10.1016/j.yebeh.2016.11.021. PMID 28169144. ^ “Establishment of a New Drug Code for Marihuana Extract” (PDF). Federal Register, Vol. 81, No. 240. December 14, 2016. ^ See, for example: “DEA Sparks New Battle With Marijuana Extract Makers”. Forbes. December 19, 2016.